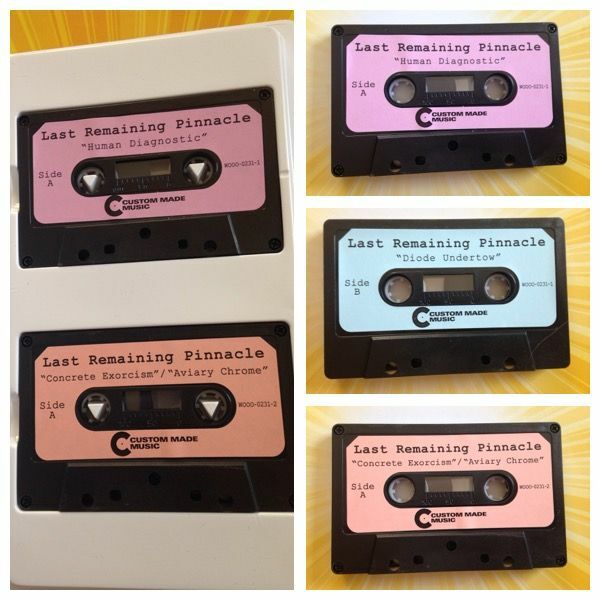 Last Remaining Pinnacle brings forth five songs across two cassettes and, well, most of these songs take up an entire side of a cassette but I've never really been bothered by box sets or more than one cassette for an artist to do what they feel like they need to do, so I say bring it on. 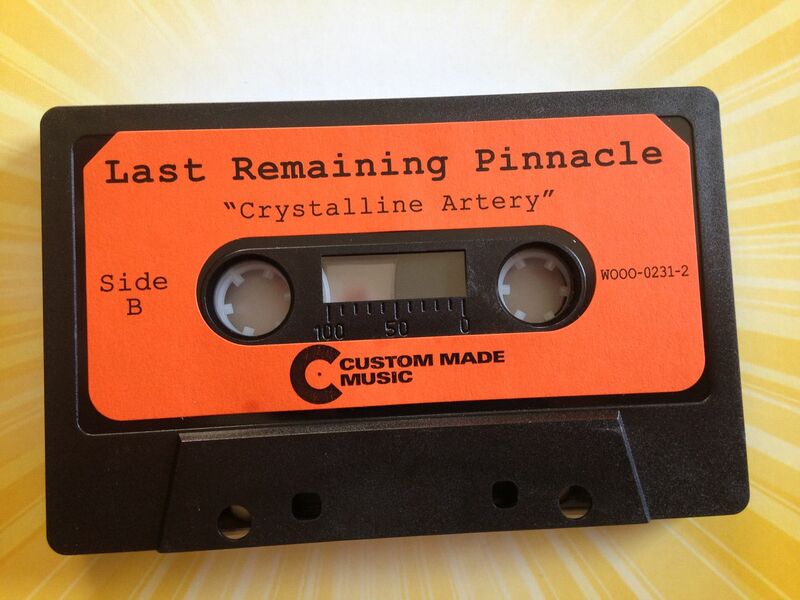 The only time I feel like something like this doesn't work is if the artist has a continual song that would be broken up by being put on cassette but Last Remaining Pinnacle seems to know what they are doing here and so your best advice is to just sit back and enjoy this one. 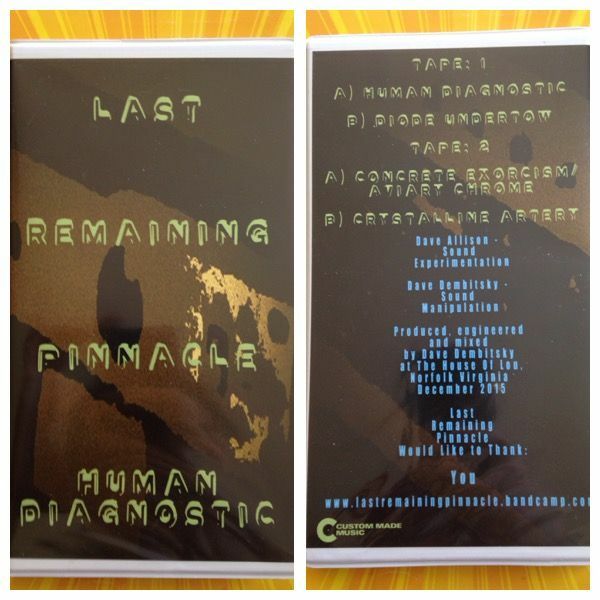 "Human Diagnostic" begins with the titular track, which is Tape 1/Side A. There is this ringing drone to start it all off. It's part space adventure part mad scientist. Frequencies can change just as easily as screeches and whirrs come through. The level of sharpness and just overall loudness can increase and decrease as if through waves. An alien-feel also exists within it. Eventually, the ringing can also come across in such a manner that it seems to be an alarm going off, though if you listen to this long enough you'll start to hear many different sounds within these experimental electronics. The sounds also begin to go sonar- which have that underwater feel- and it seems as if we are in a submarine and there is some sort of emergency. I know I've toured submarine bases before, as there is a nice one here in Connecticut, but this does also remind me of "Sealab 2021" at this point for whatever reason. It then breaks down into this sort of haunted feel where at first the general tone of the music seems to take us there but then the sounds are even manipulated to where they feel like they are coming out as screams. After those screams somehow turn into laughs, the music begins to grind. It reaches this mechanical point where it feels very methodical. At the beginning we could have been floating through space or sinking underwater but now our intentions seem rather clear and our path is determined. The build takes us up, up and away as if we are in that glass elevator with Willy Wonka, shooting up out of the building and into the sky. And then we somehow reach a sense of calm and are back to simply floating through space. On Side B of the first tape we have "Diode Undertow" which begins with a triumphant sort of ringing. This brings in some robotic sounds which remind me of the Daleks. Swirly lasers bring out alarms and there is some Transforming in here as well. As it grows darker and deeper, all of this still seems to exist within this electronic cloud, a virtual tornado in some sense, devouring all which is within its path. The whirrs begin circling, as they come out rather loud, like huge sirens in some kind of old army raid city you might have read about in books or simply a scene from "The Great Escape" even because why not, I like Steve McQueen. This all builds only this time it does so to a sharp degree-- a note which pierces through my ears and no matter how hard I try every time I listen to this I just have to turn it down because of my growing tinnitus. 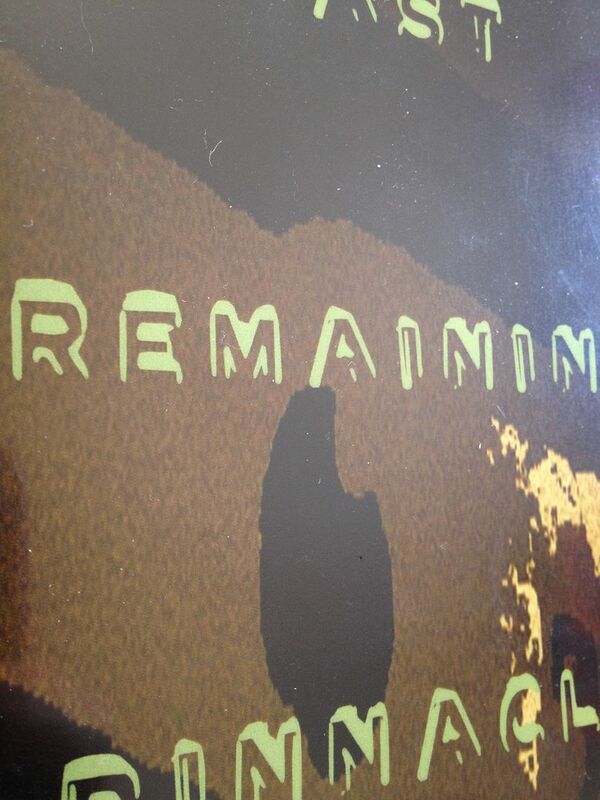 It wanes in and out, but still holds on pretty steadily, pretty strong. Some pretty fun sounds come through in loops in the background of it all and so far this piece has been about having something exist in the foreground while other pieces danced around behind it. As someone seems to be saying "One" and it echoes, as if in a countdown, there are space laser blasts. The sound of an accordion can be heard next and then this sort of back and forth comes through like mind control. The whole think seems somewhat hypnotic now and if you've ever seen anyone try to hypnotize anyone else in film or television during the 1970's or 1980's- complete with the circles increasing in size as they seemingly come out of the screen then you will have a decent idea of what is going on at the end of this piece here, but boy is it a trip. On the second cassette Side A we have two pieces, the first of which is called "Concrete Exorcism". It begins with this steady, beating pulse which is somewhere between Knight Rider and someone just tapping a button. It builds and feel like it is skipping and it just becomes the entire song, even if it is surrounded by other sounds. These loud bursts of static come out and it's not the easiest thing to describe listening to but in some ways it does sound like an exorcism of some kind. I just imagine that the constant tapping pulse is someone (Constantine or a priest perhaps) reciting the words which are needed while the demon slowly sticks its head out, a little bit at a time. I do feel like being familiar with "Constantine" (or Johnny Hellblazer) could help with the visuals here but it is not necessary. Stabbing sounds come in to end the song but they remind me more of the movie "Pulse" as it feels like what is being stabbed at is technology-based and not human or demon. This sets up for a fitting follow up with "Aviary Chrome" as it starts in a somewhat haunted way because it gives off the aura of being in a graveyard. Loud sounds such as screeches and just other things you don't want to run into in the dark come out and while this might not have a demon in it (or an exorcism) the tone definitely is set for some sort of wonderful horror movie. What could possibly be coming from a theremin appears to be muted somewhat and trying to become louder. This brings about R2D2 type electronic beeping and I can now only imagine that we are in "Star Wars" and R2D2 is meeting some sort of weird creature that needs saving. Tiny, sharp pitched tones can be heard and though it's not entirely the same as it was before it still reminds me of some sort of electronic mice while the cat nearby gently purrs along. Words are spoken through distortion and most of these other sounds remain as well. It then sounds as if the voice begins to choke, gasping for air, the cat still purring. Squeaking which does not sound like rodents brings about otherwordly darkness and then it eventually comes into this faster paced high-pitched tone which goes back to that earlier hip-hop song I mentioned but for whatever reason it also simply reminds me of a sped up version of the "South Park" theme (I can really hear Kenny's part in there) In many other ways though, it does also feel like an alien is trying to communicate with us which is a possibility I will never rule out completely. The pace increases and a lot of these faster paced squeaks brings us to a close. On the last flip side, the very end, we have "Crystalline Artery", which tells two stories with some other sounds mixed in. At first it is a haunted ringing and then there are also these space bubbles added into that. It becomes a loud drone glow though- which reminds me a bit of Lost Trail- and stays like that for quite some time. There are some louder screeches coming through and then eventually it gets into these big synth beeps which resemble beats. I think I hear a harmonica blasting through as well but I'm not sure. When it ends the looping is done by this loud ringing. It goes back and forth between two notes like a "do-do do-do do-do" only it doesn't make a sound which I can explain to you with mere words. It's somewhat scary in the way that it could be a tidbit of a soundtrack by John Carpenter but it also feels like that ringing in your ears you're supposed to get when someone talks about you. Either way, it serves as the majority of the end of this side and let me tell you something, if you don't take this trip then you are really missing out. It might seem like a lot but in the end it is worth it. The first time that I listened to this one all the way through I actually broke it up. I didn't want to think of it as being one long song, even though it is in some ways a single release, so I listened to one song then waited a few hours and listened to another. Then I waited a few days before starting the second cassette, to give it that feeling of being separate even though it really is altogether. I've since listened to it from start to finish over the course of a long afternoon and I have to say that even though time might not allow you to do the same that is the best possible way you can experience this.